Greek mythology is beloved the world over for its tales of heroism, literally creating an entirely new genre of literature known as the epic poem specifically to tell the tales of the gods. The residents of Mt. Olympus are unique in the classical world of deities in that they are perhaps the first major example of gods that resembled the people who worshipped them. And, there’s something quite nice about that. I mean, Anubis is swell and all, but I’m not sure I’d be comfortable inviting him over to my house for hot dogs and wine spritzers what with him sizing up my Pomeranian. Or would he? I suppose technically he’d have the stomach of a man, but the brain of a jackal. Sorry. Not the point. I digress. There’s a word for this kind of thing - dressing up gods in the skin of man, rather than, say, a jellyfish or a candy bar. Actually, there are a few words for this kind of thing. Let’s all learn them together, shall we? Anthropomorphism is a term many of us have come to know and love over the years. It means to assign human form and characteristics to a non-human entity. Those old-timey maps where you see the west wind’s face all puffed up, blowing a ship across the Pacific Ocean? That’s anthropomorphism. But, there’s actually a more specific term when it comes to deity known as anthropotheism. Anthropotheism is the specific assigning of human form and attributes to gods, with scholars pointing to classical depictions of Greek and Roman gods and goddesses as examples-in-chief. You’re thinking I know this already. I get it. What’s the point? The point, you impatient minx, is that we likes us some human - not merely humanoid - gods. Over our history we have related best to the divine when we believe they also have problems with fidelity or fraternizing with the wrong crowd or...frost giants. Ok, maybe not so much that last one. It is the first way that we put god in a box, and it’s not just us Pagan folk who do it. Christians have the old bearded guy (who has the musculature of someone in his late 20s) on the ceiling of the Sistine Chapel. From Kwan Yin in the East to Odin in the North to Buddha to Pele, the face of the divine around the world - more often and more so as time goes on - looks a whole lot like ours. All of this helps our teeny tiny brains cross over a threshold of belief and understanding when it comes to relating to and having a relationship with the divine. What if, as a female, you don't relate to the maiden/mother/crone archetype? Plenty of Pagans choose to remain happily childless and sometimes it feels like being in "nowhere land"; not a maiden, nor mother, yet to be a crone. I have my personal opinion on this archetype, but I would love to hear both your ideas about the triple goddess as far as factual research and history go and whether or not these archetypes really matter since many of us do not have children for a variety of reasons. 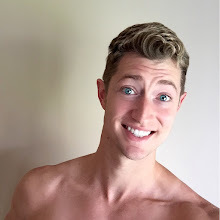 I can paint and write and sculpt and create loving relationships and make fantastic meals and every spring I can plant seeds and every fall I can reap a harvest. Believe me, I can create just as well as any high school quarterback and head cheerleader in the back of a ’97 Ford. Creation of a human child is just one method of creation. It would be easy for me to respond to the initial question by saying that just because one has no wish to be a mother, it doesn’t mean one is any less capable of “giving birth” to ideas, projects, personal interests, businesses, etc. It doesn’t mean one cannot be “motherly” to others, to nieces and nephews, to the elderly, to your pets. However, as with everything, I feel that this situation merits an updating of that concept of creation and how we relate to it. But, first, I think there is one more term to define, the term of the Goddess of NeoPaganism. Who is she, and where did she come from? In his book The Triumph of the Moon, author and historian Ronald Hutton makes the claim that the concept of the Triple Goddess is a modern creation by Robert Graves, an English poet and scholar who penned the book The White Goddess. Hutton further claims that Graves compiled work by authors who have been equally celebrated for their work and derided for it: Dr. Margaret Murray, most famous for her propagation and distortion of the Witch-cult hypothesis as well as almost single-handedly coming up with the false history of the Burning Times, Sir James Frazer, a social anthropologist whose iconic work, The Golden Bough, offered an in-depth look at mythology, attempting, some say, to find a universal rule for how humans perceive and worship the divine, and by Aleister Crowley, an influential occultist who developed the philosophy of Thelema. 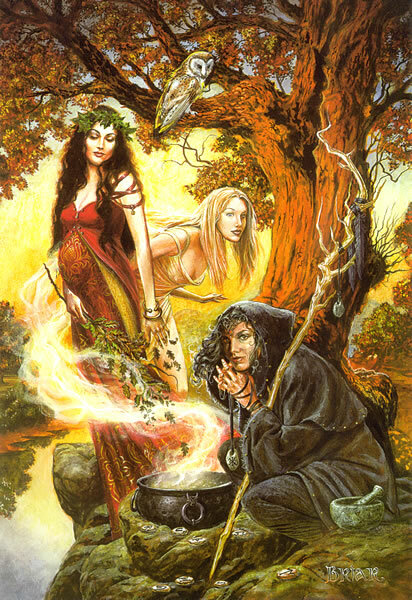 That Triple Goddess, as defined by modern authors of Pagan works, was said to be a divine cycle of Maiden, Mother, Crone. These three monikers not only delineate differences in age, but in life perspective, position, wisdom, power, and phases of the moon. Carl Jung, a Swiss psychotherapist and darling of the modern Pagan community for his work on archetypes, put forth that the notion of a triple deity (or triad), generally speaking, was a pattern throughout myth arising from the most primitive level of human mental development and culture. Divine Triads exist in Hinduism - where the concept is known as the Tridevi and includes Saraswati, Lakshmi, and Parvati as manifestations of Shakti, Norse mythology - the Norns which are cognate of the Greek Fates or Moirai, Irish myth - both Brighid and the sisters Ériu, Fotla, and Banba have been presented as possible triads. The Morrígan is a figure from Irish mythology said to have possibly been a triad, though which goddesses exactly were supposed to make up that triad varies between authors and historical accounts. But, let’s take a moment to pause and note that the concept of the Divine Triad has rarely, if ever, been depicted in myth as being a young, virginal girl, a woman in the prime of her life, and an old crone who is past the age of child-bearing. Indeed, the Greek Fates were depicted, both in art and story, as old and ugly. Likewise, the Norse Norns are both the same age and rulers of destiny, not of specific times in a person’s life. Indeed, throughout myth and culture, the notion of the young maiden, the fertile mother, and the ancient crone seems to exist mostly in the modern day, supporting the proposition by Hutton that this concept came about at the turn of the 20th century. While it is an interesting influence of art and entertainment - this theme has run rampant in modern fantasy literature, television, and film - it does not have as much historical veracity as other parts of modern Paganism. In fact, triple deities have not just existed as one gender. The Greeks would worship Zeus, Athena, and Apollo together. Egypt had the family triad of Osiris as husband, Isis as wife, and Horus as son. Zeus, Poseidon, and Hades are a triad that rules of the sky, sea, and underworld respectively. Jung is possibly most correct in that we tend to group deities together out of instinct rather than a reality based on myth and how people truly related to those deities in their respective cultures. This all leads me nicely back to the question of how one can relate to the Wiccan/NeoPagan concepts of Maiden, Mother, and Crone. But, it leads me to one final question: What about the Wiccan God? Is he also suffering from a case of split personality, or does he get to be nice and content and wholly unto himself? Here’s where research begins to fall apart. Wicca and NeoPaganism are new, and the beliefs and practices that shape up its core are still being defined and redefined by those who practice. In books on the subject written by Wiccans and Pagans, you will find one of two responses: 1) There is a triple Goddess and a singular Horned God, modeled after the Greek God Pan. 2) There is a triple Goddess, depicted as Maiden, Mother, and Crone, and a triple God, depicted as Youth, Warrior, and Sage. 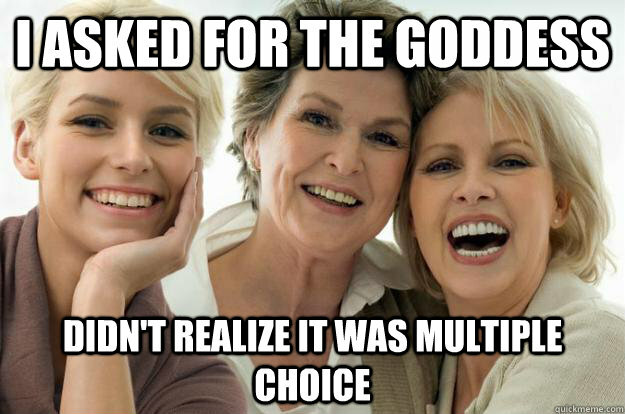 Alternatively, there is sometimes a triple God defined as Youth, Father, and Sage. I believe modern Pagan thinking, Wiccan-influenced Paganism especially, could take a tip from the evolution of the Muses in Classical Greek mythology. There are nine classical muses that represent all sorts of areas of interest, ranging from science to literature to music and theatre. We could, and should, recognize that people walk all sorts of different paths, and that our instinct is to relate to gods that resemble those paths. As was said before, we like gods that look like us, but the flip-side is that we find it hard to relate to - at least when it comes to worship and having a personal relationship with - gods and goddesses that look nothing like us, whose domain of influence is alien to our personal worldview. Anthropotheism says that we made the gods look and act like us, but the confusion here is that we think that’s where it stopped. That we created archetypes and deities and gave them names and faces and associations and carved it in stone somewhere and said THIS IS HOW THINGS ARE AND HAVE TO BE. Good news! You can continue to evolve your concept of the divine just as much as the divine continues to help you grow and change. We work together, us and the divine, because we are part of it, of them. As above, so below, right? If you need the Goddess to wear different mantels, then so be it. Perhaps this is an area where we get to personalize the triad. For polytheists, this is fairly easy, because you can pick and choose which deities best fit who you are and where you want to go in life. For folks in the softer realms of pantheism or that worship deified archetypes - such as Wicca - this can be more difficult. I think the answer can be to say that the archetype should be Maiden, Woman, Crone and leave the job title out of it. Or, perhaps, (if job titles are your thing) add as many monikers as you want. Who’s to say that the Goddess isn’t Maiden, Businesswoman, Scholar, Warrior, Poet, Artist, Traveler, Mother, Gardener, Animal Lover, and Crone? I love this. I have this crop up daily. I am a veteran of the US Army and I can give my husband (also a veteran) a run for his money during hand-to-hand. I'm 5'6" and weigh a respectable 135, while he comes in at 5'11" and around 175. Does this mean I can claim warrior? I am also a mother (as well as a step-mother). Does this negate the fact that I can knock a grown man on his tush? How about the fact that I work full time? And if you compare me to my little sister? A more nurturing and loving young woman you cannot find, yet she has no desire to procreate just yet. She is content to play Auntie to her 2 nieces and Mom to her 2 dogs. She's 25, so I suppose an argument could be made that she is still a maiden. But we have another sister, younger than her, that is a mother. And at what age do you get Crone status? My mother isn't yet 47, which I still consider to be pretty young, but she is one of the wisest women I've had the pleasure to know. My husband is struggling with self identity in this manner as well. For years he was the breadwinner. For the last 18 months though, he has stayed at home with the kids (and the dog) while I bring in the money. I think we all need to be very careful when using these terms. It sounds quite pretty to say "Maiden, Mother, Crone," but we all need to think about how this may play with the minds of women (or men, if you want to use Youth, Father, Sage). I am proud of the term Mother, but in my mind, it is because a mother is a warrior, a teacher, an artist, a philosopher and so many more things. I only hope that more people can see it in a multi-dimensional manner, instead of just in relation to whether or not you can pop out babies. I'm what I usually see referred to as a "hard polytheist" whereas I'm used to seeing Wiccan-style Paganism as "soft-polytheism". You're right, it is easier for us to pick the gods we want to work with and take them at mythological face value (and not as universal archetypes, in my opinion the gods are very specific to not only their spheres of influence, but their cultures of influence as well). It's one of the reasons I became a "hard polytheist"; the mythology of Wicca, when compared to the rich mythology of the world, didn't seem like the ancient thing it liked to claim to be. I am a devotee of the Morrighan (whichever spelling you prefer), and I have a theory about why it's hard to nail down her aspects (and I don't necessarily see them as fitting the MMC of modern Paganism at all): the Celts were not a unified people with a unified mythology (hell, this is even true of the Greeks, or we wouldn't have Hermaphrodite). It's entirely possible that different tribes had different goddesses that they called by the title The Morrighan. Of course, being as the Celts didn't write down their myths during the Bronze or Iron Ages, we'll never know if each region had separate ones that later became associated with each other in the works written by Irish monks. We work with what we have. I think one of the major hurdles of Wicca-inspired Paganism is that the Wiccan Wheel of the Year is highly influenced by the cycle of the MMC and YWS archetypes and the mythology that was created specifically for that cycle.